An area is subdivided into regions. At least one region is always visible. It is called the Main region and is the most prominent part of the editor. Each editor has a specific purpose, so the main region and the availability of additional regions are different between editors. See specific documentation about each editor in the Editors chapter. A header is a small horizontal strip with a lighter gray background, which sits either at the top or bottom of the area. All editors have a header acting as a container for menus and commonly used tools. Menus and buttons will change with the editor type and the selected object and mode. All hotkeys you press will affect the contents of the editor where mouse pointer is located. The Tool bar (on the left side of editor area) contains the tool settings. T toggles the visibility of Tool bar. 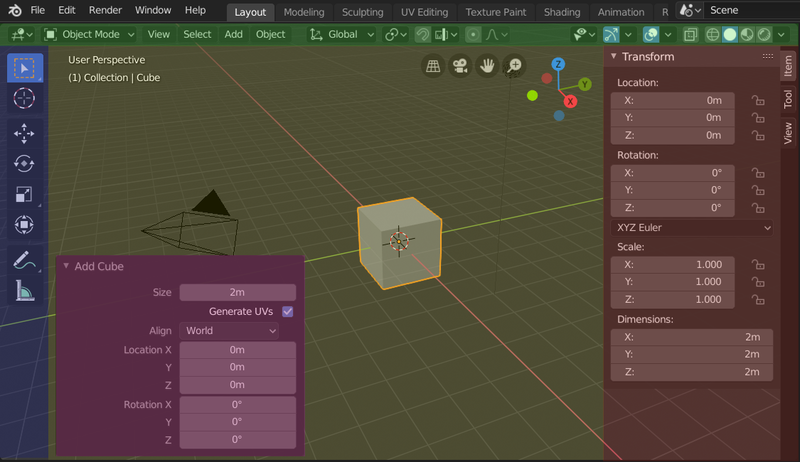 The Operator panel is a region on 3D View that shows tool options when tools (operators) are run. Operator panel shows properties of the last operator executed. The Side bar (on the right side of editor area) contains Panels with settings of objects within the editor and the editor itself. N toggles the visibility of Side bar. A region can be scrolled vertically and/or horizontally by dragging it with the MMB. If the region has no zoom level, it can be scrolled by using the Wheel, while the mouse hovers over it. Resizing regions works by dragging their border, the same way as Areas. Expand the Tool bar to show icons on two columns instead of one. Expand Tool bar more to show icons with titles. To hide a region resize it down to nothing. A hidden region leaves a little plus sign (see picture below). By LMB on the plus sign, the region will reappear.